LPI Verification IP provides a smart way to verify the LPI component of a SOC or an ASIC. The SmartDV's LPI Verification IP is fully compliant with standard LPI Specification. Our LPI VIP is proved across multiple customers. Support LPI Master, LPI Slave, LPI Monitor and LPI Checker. 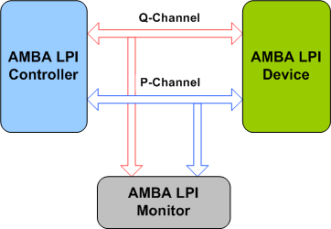 Supports LPI Q-Channel interface, P-Channel interface operations. Rich set of configuration parameters to control LPI functionality. Faster testbench development and more complete verification of LPI designs. SmartDV's LPI Verification env contains following. Complete regression suite containing all the LPI testcases.